Epitaphium (1984) for mandolin ensemble Robert Allworth 4 mins, 28 sec. Last look at Bronte (1984) for mandolin ensemble Robert Allworth 8 mins, 20 sec. Recorded/performed at: St Michael's Church, Vaucluse, Sydney, on 27 Mar 91. Lawrence Bartlett Paul Hooper, Lawrence Bartlett 4 mins, 40 sec. Tre affetti musicali (1989) for flute and guitar Philip Bracanin 8 mins, 48 sec. Recorded/performed at: Studios 301, Sydney, on 1992. 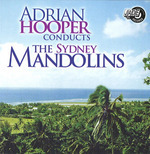 Ann Carr-Boyd Sydney Mandolins, Adrian Hooper 8 mins, 37 sec. 6 moods in miniature Eric Gross Sydney Mandolins 6 mins, 25 sec. Cadenza I, op.153/1 (1986) for mandolin solo Eric Gross Paul Hooper 3 mins, 34 sec. Three mini plectra Eric Gross 5 min, 39 sec. Also includes: Mitoka dragomirna / Armin Kaufmann -- Intermezzo / Hans Gal -- Concertino in D major / Albrechtsberger. Score & Part: South Coast tarantella : for mandolin and organ / Lawrence Bartlett. Score: Cadenza I, and Cadenza II : for solo mandolin (op.153/1, op.153/2) / Eric Gross. Parts: 6 moods in miniature, op.40A / Eric Gross.